This is a photograph from the Kinnegad 5KM Road Race, Fun Run, and Walk held in Kinnegad, Co. Westmeath, Ireland on Wednesday 10th July 2013 at 20:00. 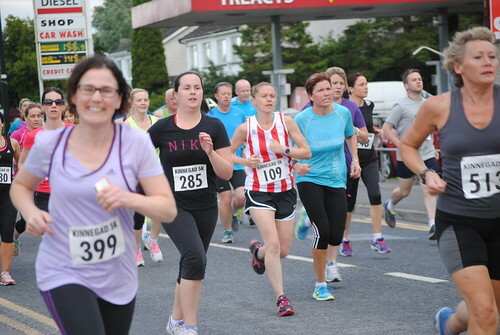 The race is organised by Coralstown/Kinnegad GAA Club who also provide the facilities for Race HQ, parking, and after-race refreshments. This is the 5th running of this race and each year it has got better and better. The race is held on a fast and relatively flat course which provides opportunities for fast times and personal bests for all participants. The beautiful weather seen a large crowd gather on the mainstreet to cheer on finishers whilst locals also watched from their houses as the race passed. A wonderful atmosphere and a credit to the local community. Coralstown Kinnegad GAA club were the main organisers of the event. As mentioned above this is a fast flat course. The course is right handed. The course starts on the old N4 Sligo Road (goo.gl/maps/JWpnK) outside of SuperValue Kinnegad. Just before the 1KM mark the race turns right onto the Killucan road. There is a downhill stretch at the 1km mark where 500m later the course takes a right turn onto Boreen Bradach (a well known local walking route). The race stays with the boreen, which has a very good road surface, until about 800 meters to go where the race emerges into a housing estate. The boreen, which has grass growing up the middle in places, is very well sheltered from the elements and tonight it provided a nice cool shaded environment for participants. The final right turn is onto the main street for the finish (goo.gl/maps/es2Up) outside the newly re-opened Harrys of Kinnegad. A great spread of refreshments, served outdoors, were provided in the club house afterwards followed by the prize giving ceremony. Location Map: Start/finish areas on Google StreetView and Google Aerial provided above and below on this description. Kinnegad is very accessible on the motorway and national road network of Ireland positioned at the intersection of the M4/N4/M6/N6 roads. Can I use these photographs on Facebook for profile pictures, posts, and cover photographs? Yes! - of course you can! But please remember - if you just take a photograph and use it on Facebook as a profile picture, wall post, or cover photograph none of your friends will know who took the original photograph. The use of photographs in this way gives photographs added value and importance. Please credit us by putting a link to this set of photographs or our Flickr account in a post on your Facebook page. This only takes two minutes and it means a lot to us. Otherwise people will never know who the original photographers are. I want to download these pictures to my computer or device? I want get full resolution, print-quality, copies of these photographs?